By the time you finish reading this page and watching the video, you will understand how to work backward to find the area of squares and rectangles. Students generally know the formula to find the area of a square or a rectangle. However, not all problems are as easy as requiring you to find the area given the length and width. In some problems on area, the length or width (or both of them) of the rectangle is not given. You need to look into the picture and work backward to find the area. 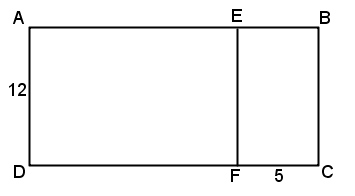 In the figure above, what is the area of rectangle EBCF ? The recorded session below is based on the same idea. Areas of different portions of a rectangular piece of paper is to be found out. The portions themselves are also squares or rectangles but you need to look into the picture to figure out some of the unknown sides. Notice how the student got confused in the beginning but recovered well and went on to find the correct answer with a little help. Did that make sense? This is exactly how some students send me their math homework and we go over them together. In the figure below, ABCD is a square. 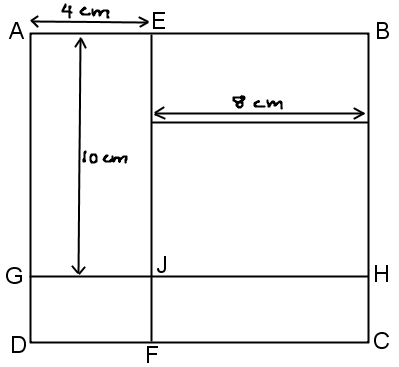 Find the area of rectangle JHCF. Assume all angles to be equal to 90°.